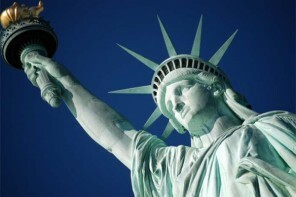 Enjoy a private Statue of Liberty tour. Lady Liberty is a symbol of freedom and democracy around the world, and Ellis Island, a gateway to the United States for 12 million immigrants, is now home to an Immigration Museum. Tour Booking Recommendations: If you would like to visit the crown of the Statue of Liberty, it is a good idea to book this tour months in advance so that we can secure the tickets to visit the top of Lady Liberty. If you would like to visit the pedestal at the base of Lady Liberty, which features great views and the museum, pedestal tickets are required. While pedestal tickets are easier to obtain than crown tickets, you will still want to secure pedestal tickets as soon as possible. Consider combining a Statue of Liberty tour with a World Trade Center tour: You may wish to combine these tours on the same day. It usually works best to visit the Statue of Liberty and Ellis Island first thing in the morning and then visit the World Trade Center afterwards. Please read about Doug’s World Trade Center tour. The Statue of Liberty, dedicated in 1886, was a gift from the French people to the American people. Frédéric Auguste Bartholdi designed Lady Liberty and Gustave Eiffel designed the internal truss structure that supports the facade, which is composed of 300 thin copper sheets. 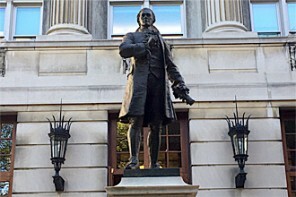 Richard Morris Hunt, the American architect, designed the pedestal of the statue with rusticated Connecticut granite. Lady Liberty and the pedestal rest on Fort Wood, an 11-pointed masonry fortification built in the New York harbor in anticipation of an attack by the British navy during the War of 1812. Until the 1890s, the individual states processed immigrants arriving in the United States. After that date, the federal government took responsibility for processing immigrants. In the New York harbor, the United State government choose Ellis Island for its main immigration depot. From 1892 through 1956, over 12 million immigrants arrived at Ellis Island. In 1990, an historic restoration of the main building at Ellis Island was completed and the main immigration center was converted into the Immigration Museum. Visitors can view exhibits about the history of Ellis Island and the immigrant experience. Doug Fox is a licensed New York City tour guide. 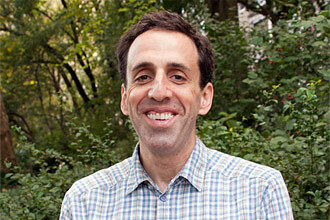 He conducts history and architecture tours in New York City. Doug Fox is a New York City tour guide and a native New Yorker. He conducts history and architecture tours. He offers private and group tours. Contact Doug Fox to learn more about his tours. Email: dougfoxnyc@gmail.com or call: 917-226-6914. 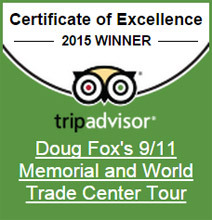 Doug Fox is a recipient of a 2015 and 2016 Certificate of Excellence from Trip Advisor. 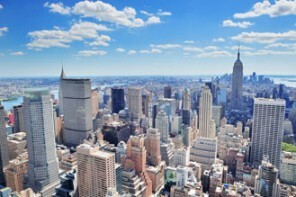 Read Trip Advisor reviews of his World Trade Center and other New York City Tours. © 2017 Doug Fox. All rights reserved.